2000m² dedicated to dry docking are welcoming you in front of our office. For all crane works,we have two boom-trucks on the dockside of the boatyard ready to move your boat in total safety. With a 48 meter boom and a capacity of 80 tons, our Liebherr crane can lift even the largest boats and also perform mast stepping, and a second 14 tons / 19 meters Griffet crane is also available. 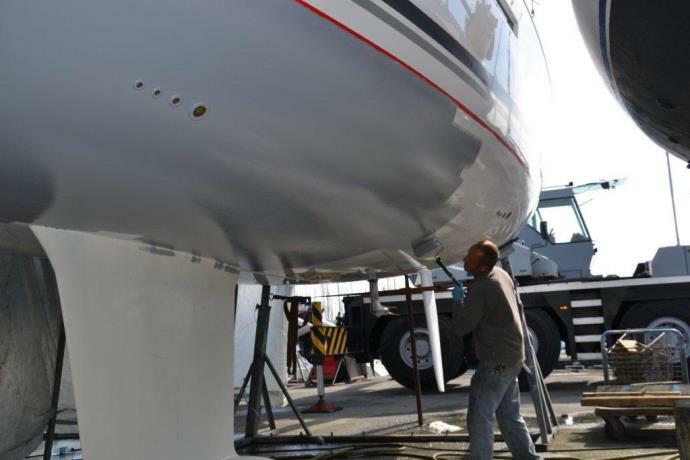 Our team realize every routine operations on your boat, with the only goal to satisfy you and give to your vessel all its original brightness ! We are ready to answer all your enquiries and solve your problems on our dry docking area, don't waist your time and your money : come and meet our team !